Birds that migrate long distances have adapted to the world's changing climate in unexpected ways, a study shows. As the planet warms, and spring arrives earlier in Europe, birds are being forced to change their migration patterns. It had been thought that birds travelling long distances from Africa to Europe would be unable to adapt. But a study in Science suggests they have evolved in response to climate change and are returning earlier. The need for migratory birds to time their arrival at breeding grounds with plentiful food supplies is a known evolutionary pressure. Scientists had assumed that birds travelling short distances would be better able to adapt - and arrive earlier for spring - because of similar climate conditions in their nearby winter grounds. But researchers in Europe decided to test this theory, using long-term banding and observational data from Scandinavia and Italy dating back to 1980. 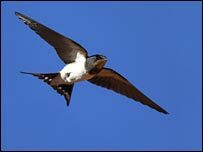 The study revealed that long-distance fliers have adjusted their migration habits to arrive earlier in northern Europe in time for the start of spring. This suggests a more permanent change in migratory behaviour due to climate change than previously thought. Study-co-author Nils Christian Stenseth, from the University of Oslo in Norway, said migration in the species studied was thought to be a biological response triggered by day length, and not climate variations, in breeding grounds. "Long-migrating birds arrive at least as early as short-migrating birds," he told the BBC News website. "The trigger is probably related to the length of day, or the photoperiod. "Birds typically respond to the right photoperiod for bringing up as good offspring as possible." The birds begin to reproduce at just one year of age and so have the potential for a rapid genetic response to recent environmental events. They are showing a "surprising and interesting evolutionary response to climate change", he added. The research is the latest in a string of studies looking at the widespread effects of climate change on birds. Dr Paul Donald, senior research biologist at the Royal Society for the Protection of Birds, UK, said populations of long-distance migrants breeding in the UK and across Europe were showing worrying declines. "This study highlights the potential role climate change is playing," he said. "However, we must not ignore other potential factors affecting their fortunes here in the UK or on their wintering grounds in Africa."